Researchers have unearthed the fossil remains of four snakes that are 70 million years older than the oldest snake previously discovered. The finds rewrite what scientists know about the creatures, showing that they were slithering alongside pterodactyls and other dinosaurs as early as 167 million years ago. "We've nearly doubled the geological range for a group," said Michael Caldwell, a professor in the Faculty of Science at the University of Alberta, and lead author of a new study in Nature Communications. Not only do his findings offer clues on how these reptiles may have evolved, they also reveal that the snakes of the dinosaur age probably didn't look all that different than their modern-day relatives. Though dating from 140 million to 167 million years ago, the fossilized skulls, jaws, ribs and teeth share many features seen in today's snakes, such as the flexible jaws and sharply-angled, backward-pointing teeth which are instrumental in helping them devour their prey. They also have features found in lizards such as its vertebrae. Caldwell said he was surprised snakes had changed so little over such a long period of time and that they were still so clearly "identifiable ... as snakes." Normally you would expect to dig up something that shared traits with modern animals, but looked different, perhaps more like some sort of chimera of two familiar beasts, he said. "You know like the bird-dinosaur idea. You wouldn't be looking for a modern duck in the middle of the Cretaceous." The oldest of the fossils (the diminutive Eophis underwoodi) came from southern England. The largest, Portugalophis lignites, came from coal deposits in Portugal, and was a much bigger individual at nearly a meter or more in length. Around 150 million years ago, the locations in England and Portugal were swampy coastal areas on large island chains in the Jurassic seaway that covered most of what is now Western and Central Europe. The one North American species identified, Diablophis gilmorei, was found in river deposits in Western Colorado. The locations offer evidence that the snakes came from a marine environment. "Is it possible, like a lot of other animals today, they moved around the planet by swimming? Yep, it's very possible. Almost all modern snakes are perfectly comfortable in the water," Caldwell said. Caldwell also believes these snakes probably had four limbs - though there aren't the fossils to prove it. 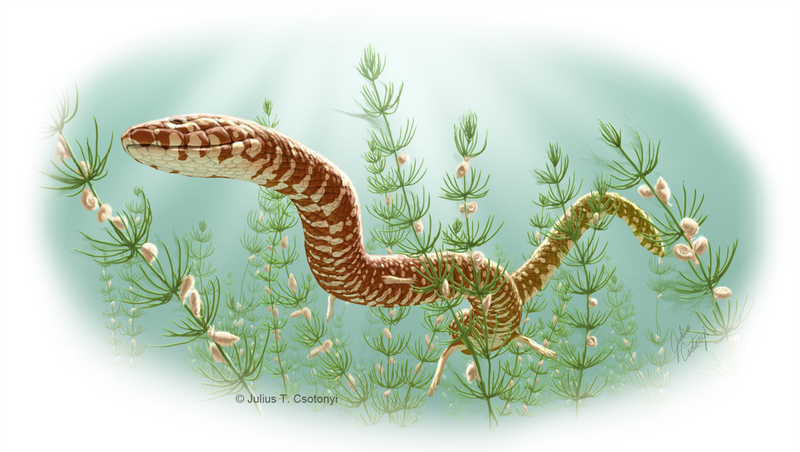 An earlier discovery from Caldwell and his colleagues turned up 100- to 90-million-year-old marine snakes from the West Bank, Lebanon, and Argentina that still possessed small but well developed rear limbs. They also varied in size: A snake fossil from 60 million years ago called Titanoboa was probably about 10 times bigger than snakes today. "It could very well be that what you would see in terms of the missing link features is that this animal would have had four legs and a short body," Caldwell said. "Body-wise, it wouldn't have looked like a modern snake but the skull is clearly demonstrating very snaky features." Caldwell said the latest discoveries probably aren't going to settle a long-running debate about how snakes evolved. Some said they evolved from burrowing animals - based on primitive, blind snakes alive today that live in burrows - while Caldwell and his supporters have argue they evolved from four-legged, lizard-like ancestors that thrived in the oceans and emerged onto land. "I suspect we will never put that debate to rest," he said. "It's a very fine scale question and an interesting one ... We have an anatomical and a relationship problem and then we have to find that point in time in the fossil record where we would actually recognize one of these animals as a snake ... If I can find you a four-legged animal with a snake head, will you call it a snake or will we call it a snake-like lizard?" To really shore up the theory, researchers need a snake fossil further back that has four legs which could take snake evolution to 200 million years. They also need to shore up the fossil record from 167 million to 100 million years ago. That means expanding the area they have searched for snake fossils. Since the latest crop of fossils came from the Northern Hemisphere and what was then the supercontinent Laurasia, researchers will go in search of fossils in the southern Hemisphere in South America, Africa and Australia or what was then Gondwana. "We are trying to fill in those bits and pieces of the story," Caldwell said.